It is perhaps my favorite place to eat out, and the chips with salsa are, in fact, delicious. I am speaking of Chili's. Yesterday Devin and I were out running errands and decided to stop there for lunch. We walked in the place to see a sea of people and children staring, not at each other, but into these little table top tablets/computers. All of the tables had them and some had two. The company loves them because they allow them to use fewer servers PLUS it has been shown in trial use that they actually increase appetizer and dessert sales. In fact you can use them to pay your bill and folks have been leaving larger gratuities since they have been in use. Who cares about personal one on one service? You are in too big a hurry to wait to order food! This is America and we like to eat NOW! The company also brags that these tablets will also give the current weather conditions. Wow! That is so fabulous. How did we ever function in a restaurant before? They are a fabulous idea, right? Parents can place one in front of their kids, so the kids can play and be occupied. That is why we eat out as families, after all, so we can stare at electronic devices and be void of any and all conversation. If you have youngsters who just can't seem to act like respectable kids in a restaurant, then here is your ticket out of a disaster meal. There is no need to teach proper behavior, just sit them down with this fancy device. They can play unlimited games for the bargain price of .99 cents, and that is quite convenient for those times your kid forgets his/her IPOD or Nintendo 3DS. What's even better is that this will allow YOU more time to stare at your smart phone. You might miss something brilliant that was posted on your Facebook, right? You wouldn't want something as important as family dinner or having a real conversation with your loved ones to interfere with the latest viral video posted on FB. The success with these tablets has been such that hotel restaurants are considering using them to increase their sales as well. I suspect we will soon these at many major chains because, you know, money talks. When we sat down to our table I turned the thing around so it wasn't facing us. The flashing lights was a distraction and I had some serious chip and salsa eating to do. We never used the thing, as I am sure it had germs and grease and grime on it anyway. We also didn't pay with it, I prefer to give my server his well earned tip in person. When we left we saw a table with three kids and two of them had tablets in front of their faces while the other had an IPOD. Mom and dad had smiles on their faces. Fabulous family dinner, ya'll. 1. If you, as an adult, cannot go through one meal without staring into something electronic then you are pathetic. You are also setting a poor example for your children. This isn't just the new fancy tablet either. Put down your d@%n smartphone. 2. If your children cannot sit through one meal without electronic entertainment then they should be eating at home and learning how to eat a meal and have a conversation, without the toys. What was wrong with crayons and coloring menus for kids? Personally I will miss diving under the table to fetch broken crayons my kids drop. 3. I have had some folks tell me that when a family eats out several times per week, these tablet games really help with antsy, hungry children. To this I must say that you are eating out too often. It should be a treat, not a way of life. Stay home and cook a decent meal. If your schedule is such that it is too busy with after school activities, etc....well, I say cut the crap from your schedule. Family is more important than sports or whatever is taking away from a family dinner. 4. If you are so void of human connection that you prefer to order food and pay for the food from a computer tablet versus the nice server assigned to your table, then you should not be out in public. Seriously. Stay home. All of this to say I will no longer eat at Chili's. Sad. I do love their chips and salsa, but I think this is taking higher sales a bit too far. Half priced drafts was a good enough reason for me to stop by and eat a good meal, but this tablet device is only promoting what is already a struggle for many couples and families. Conversation, real conversation. Good-bye chips and salsa. I will be looking for a new dining experience elsewhere. Very well said. Think I'll join you in your Chili's boycott. 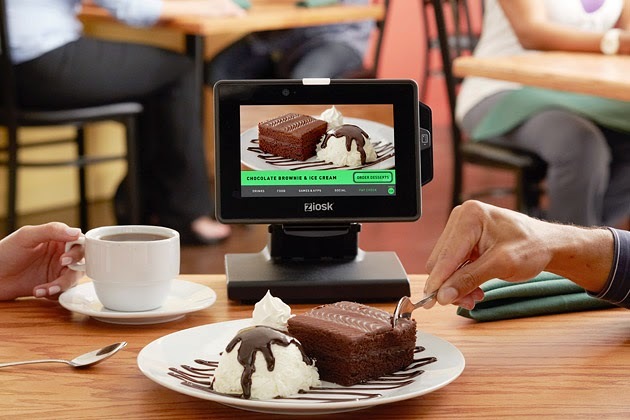 Hope you gave Chili's management some feedback while you were at the restaurant or wrote a letter to the company, made a call to headquarters--something more than just a boycott to register your dislike of these devices. You have to let someone who counts know about your displeasure and why this is not a good trend. If enough people do this, things might change. At least I'm hopeful it will. I am always amazed when I get together with adults with teens. With the exception of most the homeschool teens, the young folks constantly have their noses in their smart phones and the parents act like it's perfectly normal! Bye bye Chilis. Coming soon to all fast food restaurants as soon as the minimum wage is raised to $15! Went saturday..never going back. Very unhappy with this.